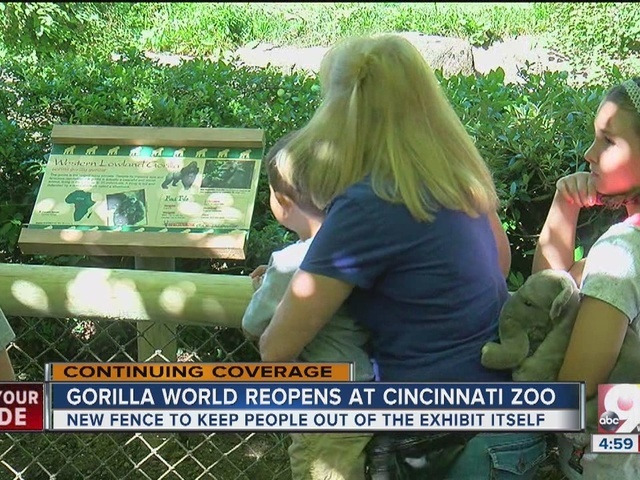 CINCINNATI – Under fire for the death of an endangered gorilla, the Cincinnati Zoo raised and strengthened the barrier at Gorilla World before reopening the exhibit Tuesday morning. It had been closed since May 28, when a 3-year-old boy found his way into the enclosure and zoo staff killed 17-year-old silverback Harambe to protect the child. Zoo Director Thane Maynard said the former barrier had been safe for 38 years and had passed twice-yearly inspections. However, the zoo still added three surveillance cameras to the gorilla exhibit and erected a higher, 42-inch fence with wood beams across the top and bottom and knotted rope netting. 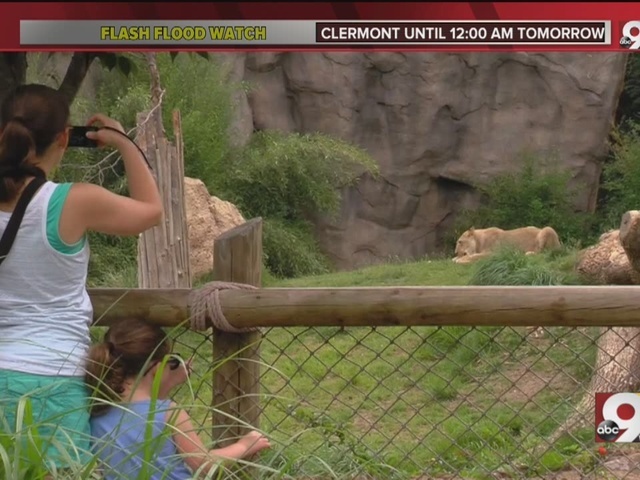 It's 6 inches taller than the previous barriers and the same height as the barrier at the zoo's lion exhibit, shown below, the zoo said. Maynard said the zoo has received hundreds of handwritten notes and cards and some donations in Harambe's honor. 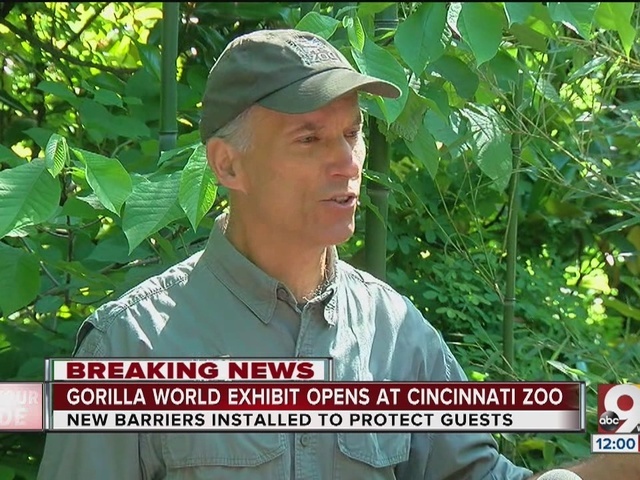 He called Cincinnati a "zoo town" for its overwhelming support provided throughout the ordeal. "I can't go jogging; I can’t go to the grocery store without people wanting to stop and talk about the gorillas in the zoo, so we appreciate all that support," Maynard said. The zoo said that this incident was the first breach at Gorilla World since it opened in 1978. 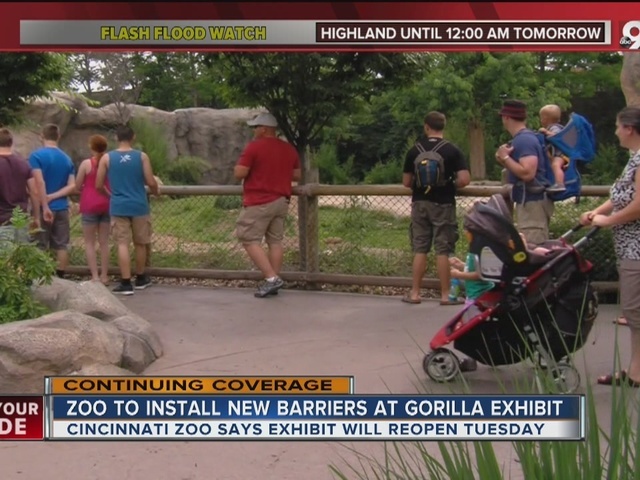 The zoo said it has spent the last several days reevaluating the exhibit. Cincinnati police investigated the incident to determine if criminal charges are warranted against the boy's mother for not preventing him from slipping through the barrier. Hamilton County Prosecutor Joe Deters announced Monday afternoon that no charges would be pressed against the boy's mother. RELATED: Charges unlikely, legal expert says. Thousands of people have taken to social media to condemn the shooting of Harambe. Many blame the boy's mother for letting him out of her sight and fault the zoo's security for not keeping a 3-year-old out of the gorilla enclosure. Some said the zoo should have tranquilized Harambe instead. There have even been death threats against the mother. LISTEN to mother's 911 calls after son fell into moat. More than 185,000 people have signed a change.org petition to create a law to hold zoo visitors responsible for the well-being of endangered zoo animals. Another petition blaming the child's parents for neglect and calling for them to be investigated has drawn more than 480,000 supporters.